Apple patent win: ITC bans Samsung from selling some phones in U.S.
Apple patent win: Samsung banned from selling some phones in U.S. The latest battle in the Apple v. Samsung patent war came to a close Friday, with a trade agency ruling Apple the victor. 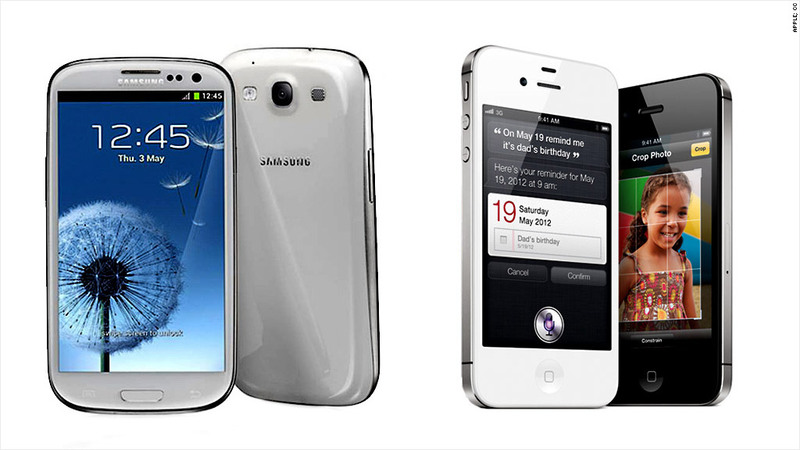 Apple (AAPL) alleged that several Samsung products infringe on its patents. Apple originally filed this lawsuit against Samsung in 2011, and it's just one of dozens of ongoing patent lawsuits currently being waged between the tech titans across the globe. In this latest case, the International Trade Commission ruled in favor of Apple. The commission said Samsung products infringed on two Apple patents, one for touchscreen multitouch and another related to headset plug detection. The court ruled Samsung did not infringe on four other patents listed in Apple's claim. The ITC banned Samsung from importing or selling some devices that infringe on the Apple patents. While the devices Apple mentioned in the case are older Samsung products -- like the Galaxy Tab 7 tablet and the Continuum smartphone -- the ITC's ruling could have implications for phones currently on the market that use the same technology. But Samsung has the chance to release software updates to work around the infringement -- for example, customers would still use multitouch the same way they always did, but Samsung would change how that worked from a technical perspective. Tech companies like to bring their cases before the ITC because it's generally easier to get that court to ban the sale of patent-violating products, when compared with the traditional patent court system. U.S. import bans are obviously serious concerns for foreign companies like South Korea-based Samsung. But they're just as problematic for those headquartered in America because most tech products -- including Apple's -- are assembled overseas and must be imported. Even if Samsung weren't able to figure out a workaround, there's a chance the ITC's import ban won't stick. Earlier this summer the ITC ruled on Samsung's own 2011 filing against Apple -- and it ended with the agency issuing an import ban on Apple products. But the ITC is required by law to send such "exclusion orders" to the president for a 60-day review. In an extremely rare move, President Obama vetoed that ITC order just before the review period was up. This case is one of four Apple-Samsung patent battles currently playing out in U.S. courts, and dozens more are being tried abroad. Billions of dollars are on the line, and the companies are warring to take each other's products off the shelves. The good news for consumers is that the trial proceedings in such disputes typically take so long that the products in question are often long obsolete by the time a judge rules.